Apex & City Chauffeurs are specialists in chauffeur driven travel, they provide chauffeured cars throughout London & South-East England. This is just one of many other smaller websites that I have created while working with Ekina. The owner of Apex & City is a good friend of mine, so I thought it would be nice to add it to the ol' portfolio. Insight Yoga is a site created to help advertise and promote a trained reflexologist, hypnotherapist, cranial masseuse, and yoga teacher. The site is fully qualified xHTML and has three separate stylesheets allowing it to have three selectable layouts. Bass Records is a site I'm putting together for some good mates of mine. They need a site where they can share and promote their tunes and events. The site has been coded in fully qualified xHTML mixed with plenty of fun little Macromedia Flash interactions. 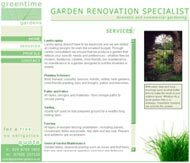 Greentime Gardens is a small, young garden renovation company. Who required a site to help promote the expanding business. The site contains general background information about the company, as well as the services they offer - as their portfolio expands these will also be added to the site. I designed and created the entire site including the main template. The main Greentime Garden logo was supplied to me. 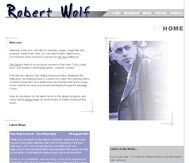 Robert Wolf Records is a promotional site for musician, singer, songwriter and producer Robert Wolf - who also happens to be my cousin! :o) The site was designed and created by myself. It uses standard ASP with a database backend - allowing Robert to administer key parts of the site himself. 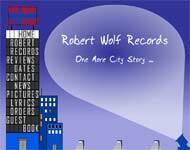 The site contains the latest news on Robert's Album(s), as well as offering sample tracks and lyrics. 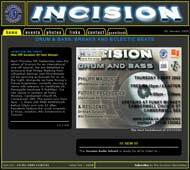 Incision is a Drum & Bass, Breaks and Eclectic Beats club night - organised by Urbanology Promotions. They required a site to promote current events and their latest news. The site was designed and created by myself, using ASP with a database backend. The site could also be administered by any member of the Urbanology Team. Incision has currently been put on hold, while the Urbanology Team concentrate on other projects, but I have re-activated the site for old times sake!